The share market correction continues and, as is often the case in significant falls, is morphing into broader concerns about global growth. From their recent highs to recent lows global shares have fallen about 9% and Australian shares around 11%. It’s still too early to say we have bottomed but views remain that it’s not a major bear market. The worry list of rising US interest rates, the US/China conflict, a correction in tech stocks, problems in the emerging world, the US midterm elections, the Italian budget and signs of a peak in global economic and profit growth is continuing to drive shares down and as we have seen in the past this is morphing into another global growth scare with investors latching onto companies that had negative profit news in the US and declining Eurozone PMIs. Shares are technically oversold again and so may see a bounce, but a circa 20% top to bottom fall in share markets as occurred through the 2015-16 global growth scare is possible and this would likely require some sort of global policy reaction to turnaround, e.g. the Fed hitting the pause button and the ECB extending QE. Of course, China is already easing. Corrections are normal. 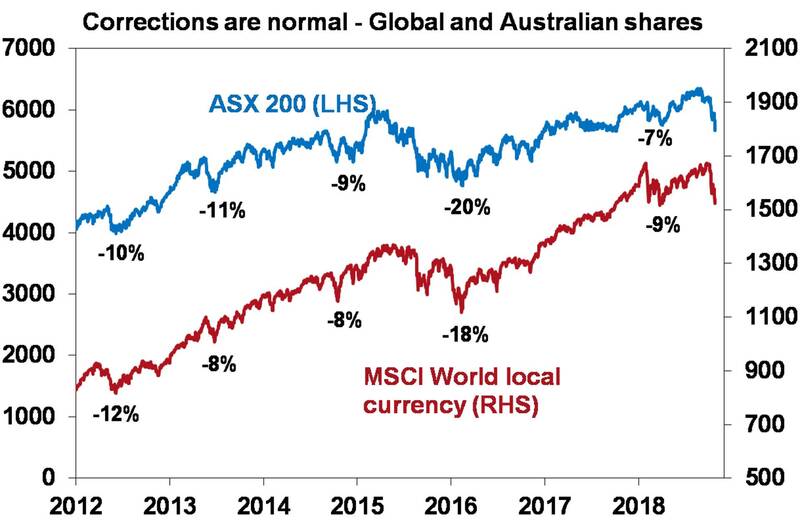 Since 2012 both global and Australian shares have seen multiple pullbacks ranging from 7% to 20%. See the next chart. The main driver of whether we see a correction or even a mild bear market (say a 20% fall) as opposed to a major bear market like the GFC is whether we see recession in the US. 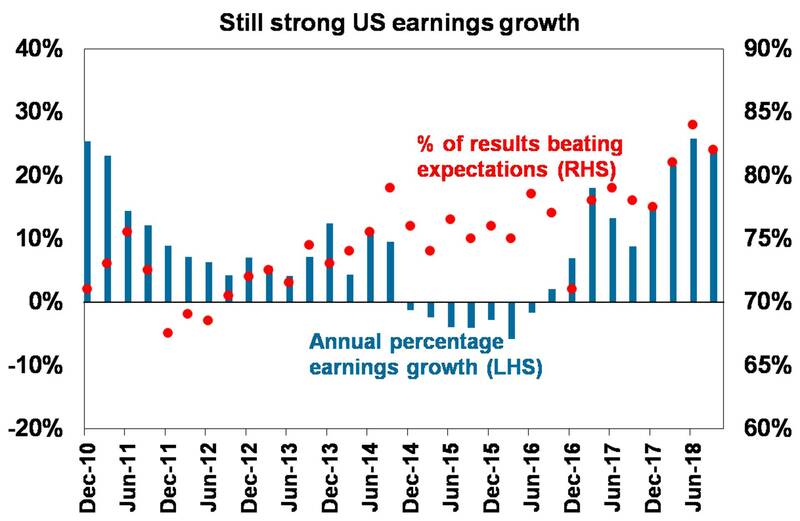 Right now this stil looks unlikely (even though the growth rate may have peaked) as we haven’t seen the sort of build-up in excess that precedes such a US recession. Don’t forget that share markets often overreact to risks as highlighted by the old Paul Samuelson saying that “share markets predicted 9 of the last 5 recessions”. While the value of shares has fallen dividends have not and so if it is income you are after this has not changed if you have a well diversified portfolio. In fact, the grossed up dividend yield on Australian shares is now around 6%. Finally, to be a successful investor you need to keep your head and that gets hard in times like the present when negative news reaches fever pitch. So it’s best to turn down the noise. There is just one other thing worth mentioning. October is known for share market volatility. Sometimes it’s referred to as a bear killer given that in the US it often sees a share fall and then a rebound. But the point is that the share market traditionally strengthens through November and December in the US (and December in Australia). This is particularly the case in years of US midterm election (which is the second year of the US presidential term) particularly once the election uncertainty is out of the way. The PMIs across the G3 are shown below. 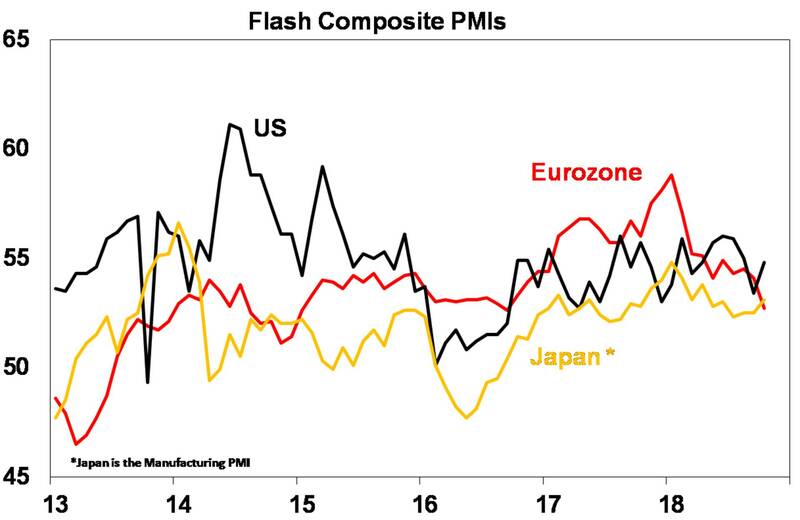 In short, the US is tracking sideways, Japan is possibly moving up and only Europe is seeing a downtrend. So no sign of a major developed country growth downturn well at least not yet anyway! It was a quiet week on the data front in Australia, but what was released was soft. The CBA preliminary business conditions PMI fell to 51 for October, down from 58 eighteen months ago and skilled vacancies fell for the sixth month in a row. In the US, the focus will be back on jobs with October payroll data to be released Friday expected to show solid jobs growth of 190,000, unemployment remaining at 3.7% and an increase in wages growth to 3.1% year-on-year. Meanwhile consumer data (Monday) is expected to show a solid rise in real consumer spending and the core private consumption deflator inflation remaining at 2% year-on-year, home prices are likely to show further gains and consumer confidence is likely to remain high (both Tuesday), September quarter growth in employment costs (Wednesday) is likely to remain at 2.7% year-on-year, the October ISM index (Thursday) is likely to remain strong at around 59 and the trade deficit (Friday) is likely to get a bit worse. September quarter earnings reports will continue to flow. Chinese PMIs for October (Wednesday & Thursday) will be watched for signs of further slowing in growth. In Australia the focus will be on September quarter consumer price inflation data (Wednesday)which is expected to show headline inflation of 0.4% quarter-on-quarter or 1.9% year-on-year with higher fuel prices and tobacco excise only partly offset by higher childcare rebates and lower electricity and gas prices. Underlying inflation is likely to remain subdued at 0.4% quarter-on-quarter or 1.9% year-on-year. Meanwhile, expect a 3% bounce back in building approvals (Tuesday) after their plunge in August, continued moderate credit growth (Wednesday), CoreLogic data for October (Thursday) to show a further decline in home prices, the trade surplus (also Thursday) to fall slightly and September retail sales (Friday) to show growth of 0.2%. Business conditions PMIs will also be released Thursday. While the $A is now fallen close to the target of $US0.70 it likely still has more downside into the $US0.60s as the gap between the RBA’s cash rate and the US Fed Funds rate pushes further into negative territory as the US economy booms relative to Australia. Being short the $A remains a good hedge against things going wrong in the global economy.